You must make reservations at least 5 minutes in advance of the time at Vinology Ann Arbor. The Kitchen closes one hour earlier than close time. Ample public and street parking, free on Sundays. Close to local bus routes, Greyhound and Amtrak in downtown Ann Arbor. Vino Value Wine tasting, Malbec Madness, Wines that Age, Beer Verse Wine, Patio Tasting, Black Wine Night. 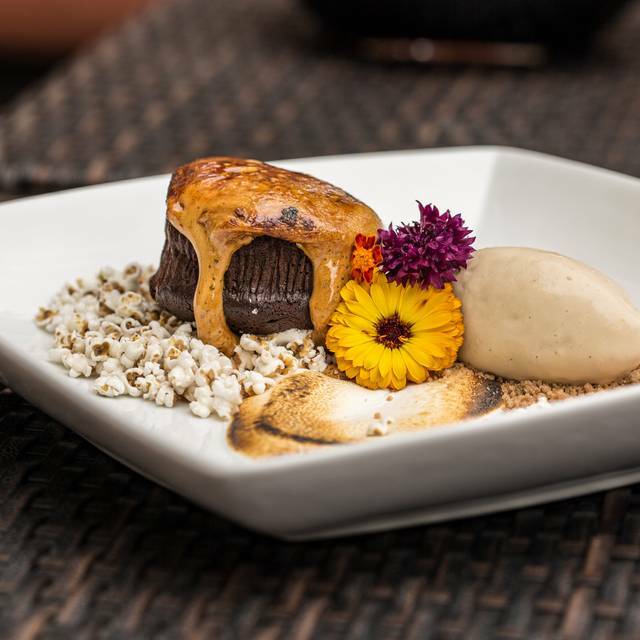 Participate in Restaurant Week, Artini Bar Crawl and are prime spot to enjoy after seeing events such as the Art Fair, Green Fair, Big Conventions, Festifools and more. Special menu packages are available for group luncheons and dinners. Inquire for details. Vinology features two completely private rooms, a third semi private area, a floating screen, LCD projector, and private sound system. Our Event Planner will be happy to work with you to meet any additional equipment or décor needs for your event. Vinology was created to be your everyday wine bar. Over the years the Jonna family has enjoyed sharing wine, food, and spirits through their love of experimentation and education. Whether you are enjoying a glass of wine at our full-service bar, an intimate dinner with friends, or gathering for a corporate or social event in one of our private dining rooms, we maintain a passion and commitment towards exceptional, and innovative, food and wine. When you dine at Vinology, you have our commitment that every detail from the food we select, to the wine we serve, to the service we provide will be executed with careful attention to detail. At Vinology, "wine" down, relax, experiment, and have fun while you educate your palate and savor the offerings! We really enjoyed our celebration dinner at Vinology. The food was great with excellent vegetarian selections. Wow! What a wine list. Not many restaurants outside of Italy where you can find a bottle of Aglianico! Terrific knowledgeable service. Impressive wine selections, both by the glass and on the bottle list. Reasonable prices for excellent wines. Food was terrific. Very good experience. We love Vinology because the menu is interesting, changes frequently, and the food is delicious! I highly recommend their beet and goat cheese dish, and the fig flatbread. Simply divine. The wine list is extensive and the waitstaff is very knowledgeable about the offerings. Vinology is an Ann Arbor gem! We went for brunch on a Sunday. It was sunny but cold out. I mention this because we asked to be moved 2x. It was too drafty by the door. Our waiter , Patrick , did so with no problem. He was happy to help get comfortable. His excellent service and recommendations really made our dining experience a great one. We’ll be back. Thank you!!! This is still one of my favorite places to eat in Ann Arbor. The food is fantastic and the service matches. I would like to see some new dishes and maybe some more creatively. However it’s only because I have been coming here for so long that I have had everything multiple times. I would like to leave a special thanks to our server Matt G who did a fabulous job. He definitely made a great impression and made the night very memorable. Thank you! We will be back and will be requesting you. Part way through our dinner our waiter asked a big favor if we would move tables to another location. They promised a free drinks and other items. When the bill comes they renegade on some of the original promises. Leaves you with a bad impression. We’ve gone here for years but we decided that was our last visit. Disappointing management. This first time visit was to celebrate my girlfriend's birthday. 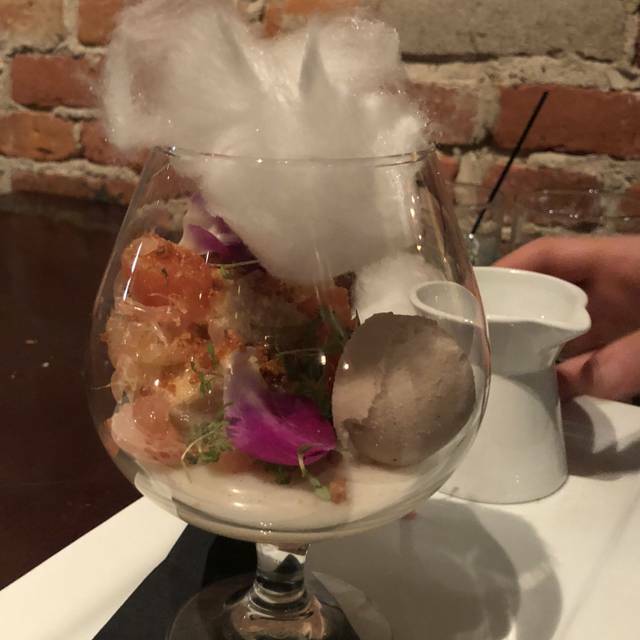 We were both impressed with every aspect of the dining experience, including the complimentary dessert for the birthday girl. We plan to return and bring friends and not wait for a special occasion, although it is perfect for that. It was definitely worth the hour drive from Ohio. Our waiter Tim was friendly and very informative. We advised him we were in a time crunch because of traffic and ability to find a parking space the reason we were late for our reservation, which they nicely held for us. The first 2 wines we selected off the list were unavailable but the suggested 3rd was excellent. The food was very good and imaginative without being weird. Would probably go back when we aren't on a restricted time schedule. Server Patrick, as always was professional, efficient, and attentive. 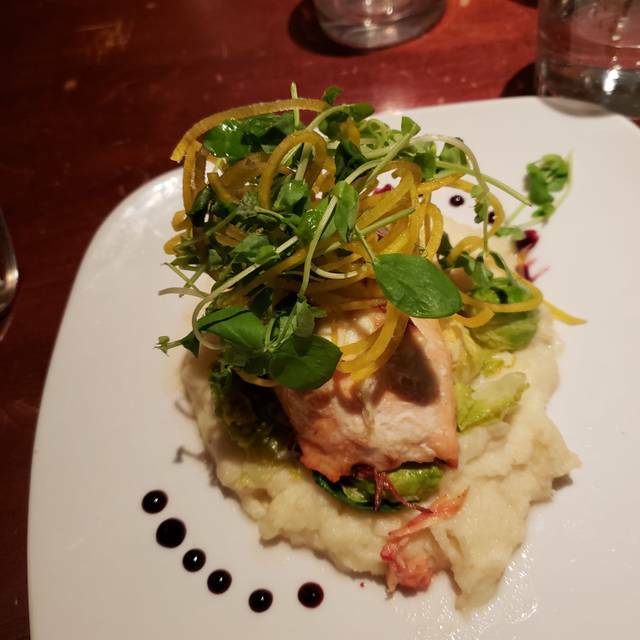 The food is consistently superb; we only opted for the divine Flammkuchen flatbread and salads, while attending the monthly wine club tasting (Bonnie Dune wines this time). 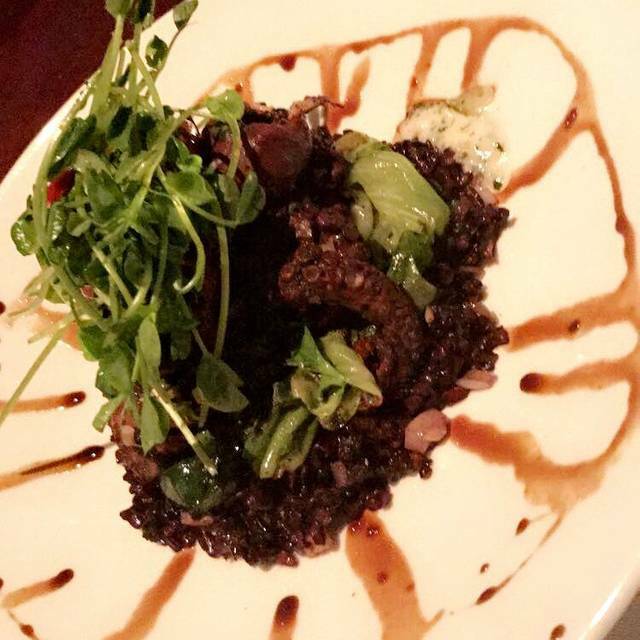 While full entrees can be pricey (for us), we've never been disappointed by their quality, presentation, and execution. 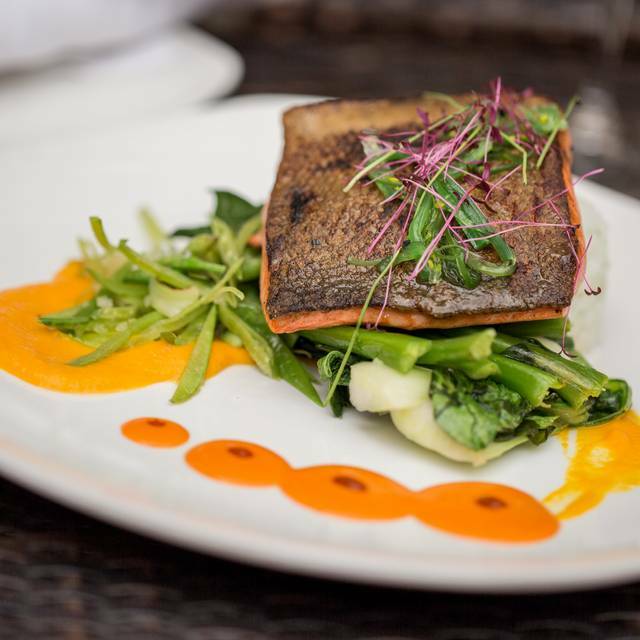 The seasonal menu is gourmet creative and varied, offering excellent choices of local fresh ingredients to suit meat, seafood, and vegetarians alike. Desserts are equally excellent, although we had none this time. Perhaps the real shining star though is the fantastic wine and beverage selection, and the expertise in recommending and serving the myriad choices. BTW, I highly recommend considering the Wine Club if you love the fruit of the grape; 2 excellent monthly selections, free monthly tasting, discounts on larger tastings and purchases for a reasonable fee. Happy hour is also delightful, with half off glasses of wine, discounts on other beverages, and great prices on the excellent flatbreads and sliders. Creative menu with options for 1/2 portions or small plates, Vinology offers a cool vibe and excellent wine selection. Our waiter was amazing--charming and discreetly attentive--just the right balance of service. The wine was great, the bison filet with rye spatzle and brussel leaves was delicious and the lemon tart a perfect way to finish the meal. Highly recommend! I go to Vinology for both business meals and personal. It is good for both. The wine list is very good. And there are plenty of good wines by the glass. Their "flight of the day" is often interesting. The food is top notch. There are good selections of meat, fish, and a few vegetarian dishes. Essentially all their main courses are available in both full and half portions. The half portion is a good amount, and is a great way to save room for an appetizer, salad, or dessert. In each category, they have some standards, as well as some creative dishes. Many things are local. The service is generally attentive. However, I notice that some of the wait staff can have a tendency to barge in and start talking to the table when the table is mid-conversation. This happened a couple of times this last time we were there. It's a minor point, but it can be annoying if it is just the wrong time. 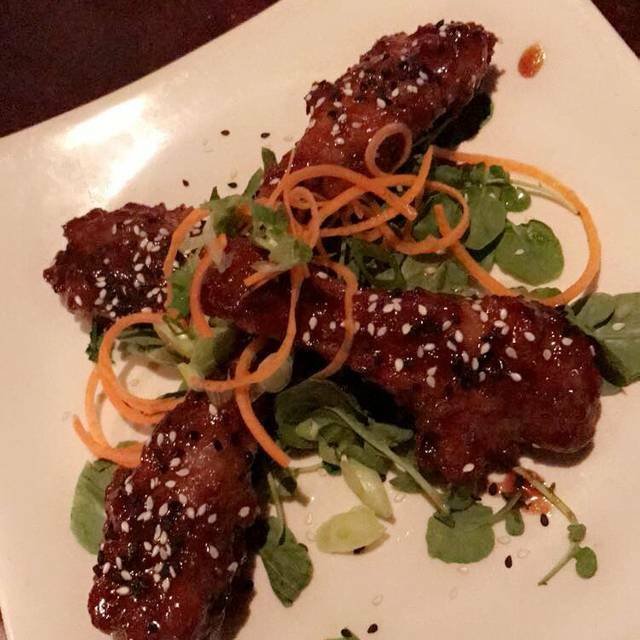 Food is as excellent as was the service! We had a great time sampling food and wine flights. The waiter Matt did an excellent job keeping up with us, as we always had a new order to put in on his passing. The venue is rather nice with it’s touch of style (Ann Arbor after all). The only negatives I have are the table we were at was near the kitchen and bathrooms. Not an ideal table, especially when you are dropping the amount of bills required to enjoy the kind of celebration we did. The other negative or maybe I should say “be warned” was just that, prices. Some wine tasting and small plate or sampling is dandy, but a full plate and glass will make a dent in your funds. Other then that ... it’s a fantastic place to wine and dine. Service was fabulous. I love being able to get a half a glass of wine. Small plates were tasty. And the sorbet was to die for. It was nice, service was good, food was better, wine and alcohol list was extensive. The one thing that was just okay was the table set up, the one long table near the entry was annoying. Only downsides were our tables proximity to the waitstaff area of the bar (noisy) and the super fancy wording of the menu. Nice food. A bit of an odd menu. Small portions for a big price. We had an amazing dinner, our waiter knew our wine preferences from previous visits, was attentive but not hovering! We will be back! Incredible food and service, wonderful place for a date. 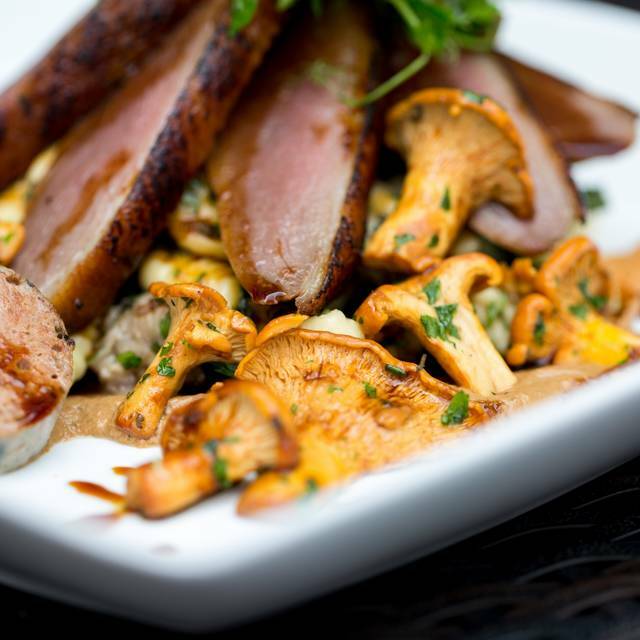 Try the smoked duck breast! Wonderful Valentines Day Dinner! Awesome atmosphere, food & service!!! Excellent food and atmosphere, wine selection was great also! As always, Vinology didn’t disappoint. Food was awesome, wine list is superb and our waitress, Katherine, was a delight. This is a great place for every day dining or special occasion. Took my date out to eat here for our first date. Everything from reservations to the bill was amazing. Thank you for helping us create an amazing memory together. I recommend with reservations. The food was mixed with the beautiful cheese board and the tasty flat breads (artichoke one was really good) being better then the entrees which cost 3x as much. The Parisian gnocchi where almost inedible (a pile of mush) and shepherds pie was dry and unappealing. The $42 fish was dry and not warm when served. I would recommend Vinology for apps, flatbread and a nice glass of wine but go elsewhere for a full meal. Vinology has a well considered wine list that I appreciate. The fact that many entrees can be ordered as smaller portions makes it possible to enjoy a meal as a collection of small plates and more broadly to sample dishes available. The last two times I've been there I was favorably impressed by some dishes being served in a style of presentation that I would call "deconstructed." This is where the elements of a dish might be served presented as parallel lines of ingredients on a plate. This enables the diner to more fully savor the separate ingredient that make up the final flavor of a dish. We find that the wait staff is well trained and is focused on making your experience as positive as possible. It's obvious that they work had for you. The noise level is tolerable so that you can have an easy conservation at your table. These factors combine for me to say that Vinology is a satisfying, interesting venue and a value place to dine. The staff is very nice for us, to arrange special table for our situation..! That helped us a lot, and food & wine is very lovely. Anyway, we have enjoyed warm hospitality from this place, I can strongly recommend the place! Nice ambiance, delicious food. One person’a entre only has one of 2 filet so she has to ask the waiter to bring her the other half of her entree.... that was kinda lame, but just a mistake. Everything else was great! Delicious wine. Even the salad was just perfectly assembled that it looked like a work of art when he set it in front of me. I love this place. I really like that it is not super loud, as many places are these days. I have only a 4 for ambience because we were not sitting in one of the really nice booths that they have. Otherwise, this was fine. Fabulous; most delicious chicken! Great happy hour too! Food and service were absolutely fantastic! Our server was so knowledgeable about both the food and wine menus, and offered some great suggestions for selections/pairings. The Brie is amaaaazing, and the Poulet Rouge was absolutely fantastic, as were the short rib tacos. We will definitely return next time we’re in A2! We had dinner at Vinology this Saturday. Like at many of the fine restaurants in Ann Arbor, the experience was uneven. For example, out of 5 dishes, 3 of them met this foodie's standard for delicious. 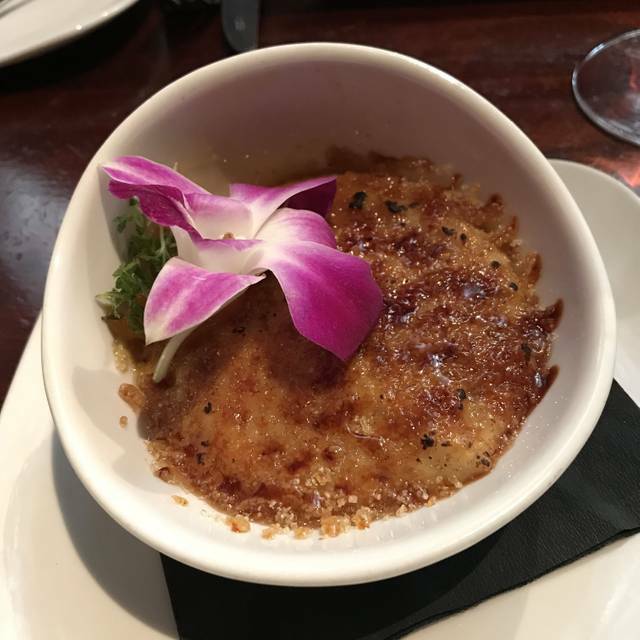 Baked brie was simple but perfectly executed and delicious; bison was tasty and perfectly cooked and the accompaniments had complex flavor and texture that really elevated the dish. Chocolate lava cake was actually a touch underdone (VERY melty and not hot on the inside), but the flavor was perfect and I would eat it again. Two other dishes I would skip next time: black cod was oversalted but otherwise the dish was bland, and short rib tacos were dry and nothing notable aside from the generous portion of meat. Our server was very nice and accommodating to our timeline (we were trying to make a show) and to our substitution requests, but he did not know details about the food or wine that I would expect for a restaurant in this category. Both our appetizers and entrees were not only delicious, but creative. Also, the wine list lived up to the name of restaurant.